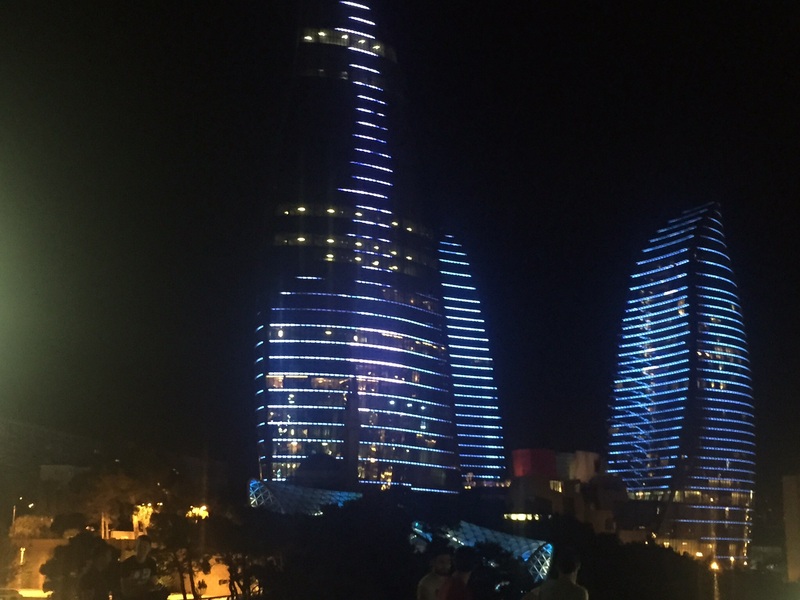 Baku, Azerbaijan’s elegant capital on the shores of the Caspian Sea, boasts glittering new buildings that pierce the sky. Looking at the futuristic Flame Towers, all sinuous curves and bright lights, you expect a city with buzz. But somehow the buzz just isn’t there. Where are the buskers, the beggars, the clamorous moments of big city life? 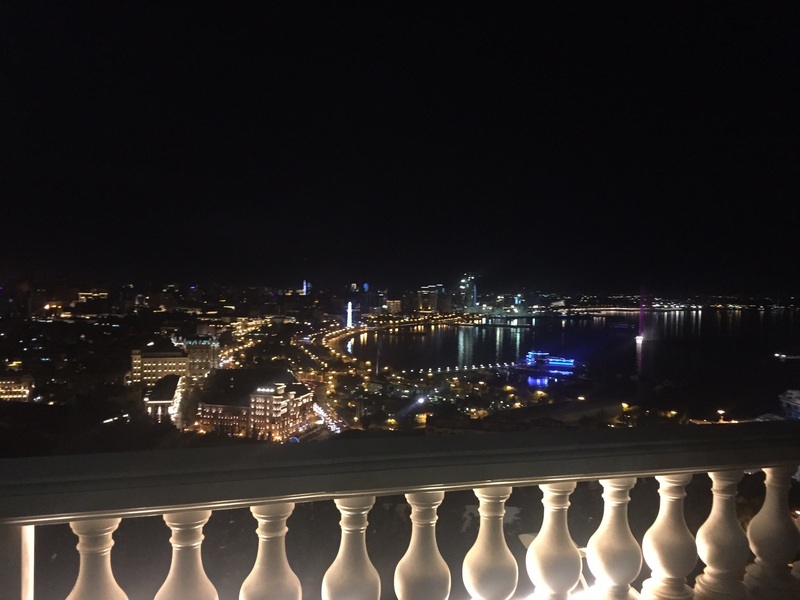 Baku, or Baki as the locals call it, is agreeable and modern, fresh from its successful hosting of the European Games in June. But something isn’t quite right – something is missing. I think it is a little concept called freedom of speech. I pick up quickly that self-censorship is in the air. You just breathe it in, along with the aroma of your morning coffee. This is a most friendly and courteous city, with a splendid tree-lined promenade by the Caspian to enchant the visitor. But it’s not a city where you stand on a soap box and denounce the government. Or if you do, you bear in mind that it could be seriously bad for your health. Sorting out my reactions to Baku, which felt to me as if it were under sedation, I started to read recent news stories about Azerbaijan. They were both illuminating and depressing. The New York-based Committee to Protect Journalists rated Azerbaijan as the fifth most censored country in the world, after Eritrea, North Korea, Saudi Arabia and Ethiopia. In other words, the committee sees Azerbaijan’s media as the most repressed anywhere in the former Soviet Union. That is quite an achievement; it beats some stiff competition. Here is a chronology of some recent events concerning Azeri journalists and human rights activists. June 2015 – Opposition journalist Emin Huseynov, director of the Institute for Reporters’ Freedom and Safety, flees the country after taking refuge for months in the Swiss embassy. He flies out on the plane of the Swiss foreign minister. 9 August 2015 – Huseynov’s successor as head of the institute, journalist Rasim Aliyev, dies of injuries in a Baku hospital after being severely beaten by a group of people the previous day. Officials link the death to criticism of a football player but human rights watchdogs say it could have been prompted by photos he posted online of police brutality and social deprivation. 13 August 2015 – Leading human rights activists Leyla and Arif Yunus are jailed on charges which include fraud and tax evasion. Leyla, director of the Institute of Peace and Democracy, is jailed for eight-and-a-half years, her husband Arif, a well-known historian, for seven years. Both have severe health problems. 1 Sept 2015 – Prominent journalist Khadija Ismayilova is jailed for seven-and-a-half years on charges which include tax evasion and illegal business activities. Ismayilova, who worked for the U.S.-government financed Radio Free Europe/Radio Liberty, is known for her work exposing corruption in the Azeri elite and reporting on the business dealings of President Ilham Aliev. During her trial, Ismayilova describes the government of President Aliev as a “repression machine”. President Aliev inherited his post from his father, Heidar Aliev, who dominated the politics of his country for decades and once headed the KGB in Azerbaijan. The president has set out his views on the core values of good journalism in a book entitled “I challenge the journalists to patriotism”. The president himself is very patriotic. You can tell because up and down the land are big portraits of him posing next to the national flag. Sometimes these portraits have a fetching stone surround. This makes them look rather like shrines, which perhaps in a way they are. It is the good fortune of the president and the misfortune of Azerbaijan’s bloodied human rights movement that the country is rich in oil and gas.. This was one of the places where the modern oil industry was born, in the 19th century, and it still has large reserves. Azerbaijan does business with Western oil companies and has been polishing a Western image, but it has jailed so many of its pro-Western intellectuals that this posturing looks hollow. Writing in Foreign Affairs magazine a year ago, Caucasus expert Thomas de Waal said that Azerbaijan had embarked on the biggest human rights crackdown in wider Europe. He said an estimated 98 political prisoners were in jail. Fuelled by its oil wealth, Azerbaijan has also gone on an arms-buying spree. In a war with Armenia in the early 1990s, Azerbaijan lost 20,000 dead and nearly 14 percent of its internationally recognised territory. This was the region of Nagorno-Karabakh and some other adjacent areas. Baku’s proclaimed aim is to win this territory back and it has been buying attack aircraft, artillery systems, surface-to-air missiles and drones from Israel, Pakistan and Russia. I did not bring up the subject of politics with Azeris I met in Baku and they inquired about matters which interested them. What did I think of Azeri women? What are British women like? What do they drink? How big is my pension? All the Azeris I met unfailingly showed me kindness. But the buttoned-up quality of the place would have tested me had I stayed for long. It is striking how quickly the outsider conforms to the habit of self-censorship. When foreign travellers in Baku discuss Armenia, their voices drop to a whisper. It’s that kind of subject; it’s that kind of place. Stephen Powell is a former Reuters correspondent with 27 years of experience in Europe, West Africa, Brazil, the Middle East and Asia. In January 2018 he is publishing “The First Toast is to Peace, Travels in the South Caucasus” through SilverWood Books. This expands on the travel blogs and comes illustrated with beautiful drawings.